Occupying the far North West corner of Tasmania, Circular Head is one of the most productive and scenic regions in the state with extensive forests, farmlands and fisheries. You can spend a day browsing the galleries, fishing from the wharf or visiting the Seaquarium. Take the chairlift or climb the famous Nut, a 152m high, long extinct volcanic caldera, providing you with spectacular views over Bass Strait, Stanley, Rocky Cape National Park and beyond. Discover the history of Stanley by visiting the many historic sites such as Highfield which began in the 1800’s by the region’s earliest settlers. Enjoy the peace and quiet of nearby beaches. Check your handicap at the local golf course. Visitors welcome and clubs can be supplied. Indulge in mouth-watering local crayfish and oysters from the cool, clean waters of Bass Strait and the Southern Ocean. Or savour succulent, prime beef, naturally fattened locally on lush green pastures. View more images in the gallery. The core of an extinct volcano, this fascinating geological formation stands at 152 metres and towers above Stanley, providing stunning 360 degree views of the township, Bass Straight, and the Rocky Cape National Park . Highfield Historic Site offers a historically accurate vision of a gentleman’s home and farm of the 1830s. 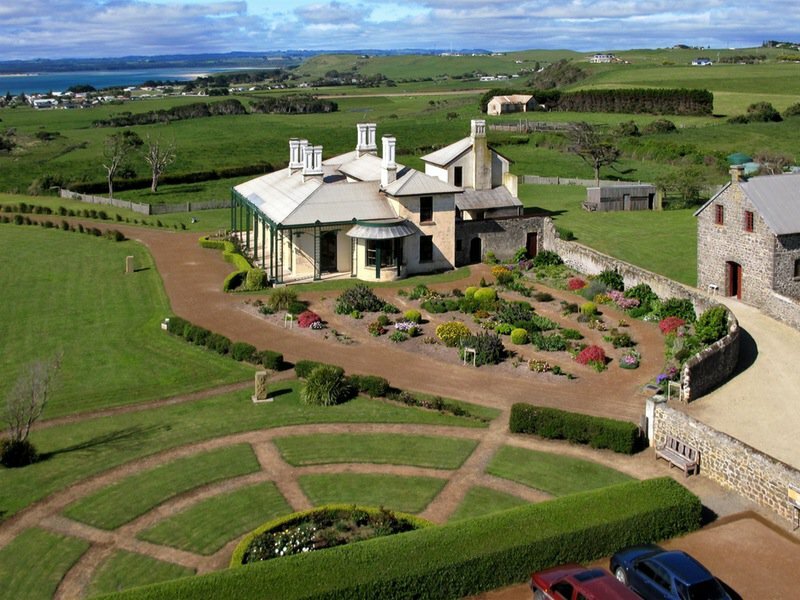 It sits on a hillside overlooking the lands the manager would have once controlled, with views across to Stanley, The Nut and Bass Strait beyond. The house is being restored over time and its elegant Regency design, convict barracks, barns, stables, and a chapel are surrounded by a large ornamental garden. Staying at Stamps of Stanley was a highlight of our Tasmanian trip. Wonderful accommodation at an unbelievable price! Thank you so much! © 2019 Stamps of Stanley.